Humans can manipulate things using two hands in an easy way due to great joint flexibility, advanced tactile sensitivity and the ability of sliding the objects on their hands to naturally find the optimal grasp and movement configurations. Actual robots are much more primitive using these kinds of sensory skills. When a robot grasps one object with one arm, the object is rigidly attached to the arm and it can move and place it with fabulous precision and strength but it cannot slide the object and re-grasp it to find better joint configurations depending on the movement. When a dual-arm robot grasps an object with two arms, the process to find an optimal joint configurations becomes a very challenging job. 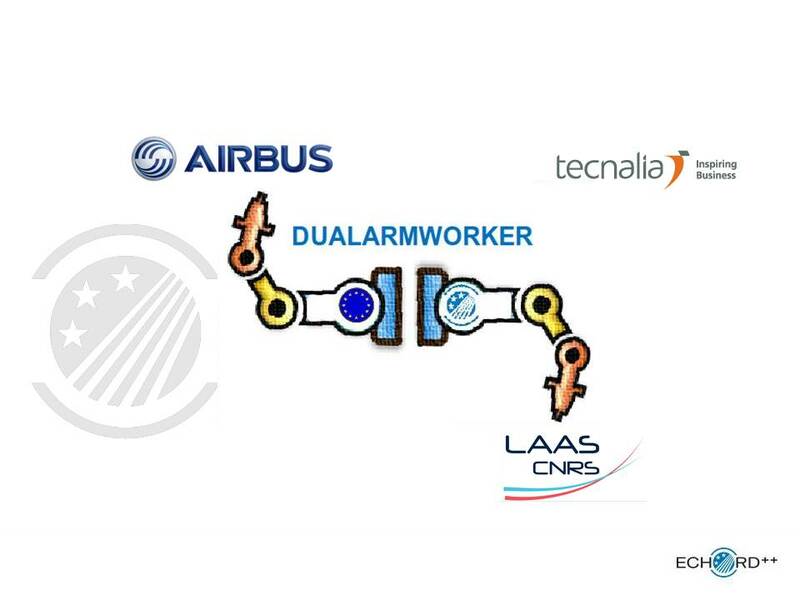 DUALARMWORKER will target and solve this key issue to the real use of dual-arm robots in assembly operations: the planning and execution of complex closed kinematics chain dual-arm motion, constrained not only by the manipulation of parts that require both hands to be held and manipulated but also by the production station environment with low accessibility and static/dynamic obstacles. No industrial software or open source library available today allows these capabilities.